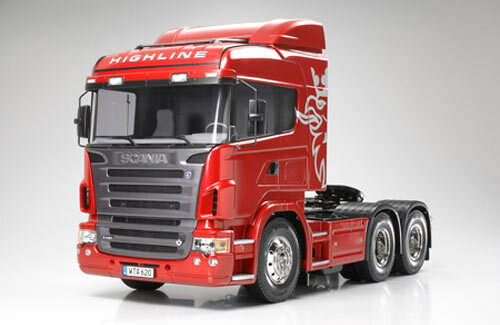 All Products > "56323 Tamiya 1/14 Scania R620 6X4"
Trucks are essential components of many logistics networks around the world. One such truck which can be seen on the roads carrying large loads is the biggest and most powerful Scania truck, the R620. Tamiya is proud to add this wonderful piece of machinery the R620 6x4 to the 1/14 scale R/C Tractor Truck lineup. This massive tractor truck features 3-axle and is 458mm long. Beautifully reproduced cabin tilts forward separately from the fenders, just like the actual truck. The accurately modeled fenders themselves are removable for realistically depicting a low carrying load. Realistic chassis and suspension further add to the imposing form of this unique model. •LEDs accurately recreate the trucks front and rear lights. •Attach the Multi Function Control Unit (MFC-01, not included) to provide sound effects such as attaching/detaching any of the currently available trailers, as well as other easily distinguishable truck sounds. •3-Speed Transmission allows gear shifting to be controlled during driving for added realism. •Cabin tilts forward just like the full-sized truck.